Went to Purdue for two years, then got a job with Allison Transmission. Married to Patricia Armstrong on November 30th 1963. We have a son Andrew born in 1970 and a daughter born in 1972. Moved to Owen county north east of Gosport in 1971. Retired from General Motors in 1992. Moved to Arizona in 1996 to pursue interest in astronomy. 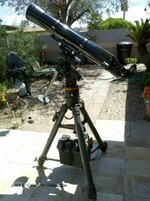 I have three telescopes,smallest is a 60mm, medium is a 6", and the large is 14". 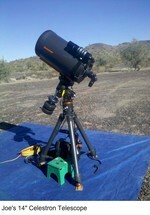 I spend one week a month around new moon observing. In the fall,winter, and spring I observe near Quartzsite Arizona and in the summer near Happy Jack Arizona. After 10 years of sleeping in a tent I bought a 39 foot Dutchstar Motorhome, now I have a nice warm bed to sleep in. I try to get back to Indiana in the Spring and Fall. Joe Goss added a comment on Profile. Joe Goss has a birthday today. Joe Goss posted a message. Happy Birthday Tony, hope we have many more. Happy Birthday Glad to hear you are still on the green side of the grass, hope you stay there many more years. Happy birthday, hope we have many more. Pat & I are in Sedalia MO at a Newmar Rally with our motorhome on our way to Indiana to visit our son in Gosport. Happy Birthday!! Hope to see at the reunion in October 2017. While you were in Indiana I hope the storm didn't do any damage to you estate there in Florida. Joe Goss updated profile. View. Joe Goss added a comment on John Wright's Profile. Seams like only yesterday we were playing in the city park.